As a program officer for the Sebastian S. Kresge Foundation, Ms. Barbara Getz listened to the increasing frustration by her Michigan peers regarding their inability to intervene at the height of concern about the HIV/AIDS epidemic in the nation. She led the creation of the Michigan AIDS Fund Committee within the Council of Michigan Foundations, creating a national model for funder collaboration in an area where there was little knowledge or experience. Ms. Getz has been a part of Michigan’s philanthropic community over several decades and offers a practical perspective gained from hands-on experience about how the infrastructure organizations collaborate to meet emerging community needs. Ms. Barbara Getz talks about her career in philanthropy. Ms. Barbara Getz talks about how the Michigan AIDS fund started with the help of Dottie Johnson, Bill White, and CMF. Ms. Barbara Getz talks about the various reactions of individuals and organizations to the Michigan AIDS fund regarding fundraising and collaboration. Ms. Barbara Getz talks about the equal participation among funders on the Michigan AIDS Fund. Ms. Barbara Getz talks about the perseverance of the Michigan AIDS Fund. Ms. Barbara Getz talks about the history of the Council of Michigan Foundations (CMF). Ms. Barbara Getz talks about the remarkable leadership of Dottie Johnson. Ms. Barbara Getz received a Bachelor of Arts degree from Wells College in 1973. Ms. Getz began her work with the Sebastian S. Kresge Foundation, headquartered in Troy, Michigan, in 1978 as a research assistant. By the time she left the Kresge Foundation in 1996, she had become the foundation’s first senior program officer. In this position, she supervised the entire grantmaking process from pre-proposal informational meetings, all the way through to grant evaluation and reporting. When she moved to the Gerber Foundation, headquartered in Fremont, Michigan in 1996, she was the foundation’s first executive director. In this position, she led the evolution of the organization from a corporate giving program to the independent foundation it is today. Through this transition, Gerber increased their annual grantmaking from $2 million to nearly $5 million. In 1999, Ms. Getz was accepted as a Harris Mid-Career Fellow with the national nonprofit organization Zero to Three: National Center for Infants, Toddlers, and Families. This fellowship provided her with the opportunity to work on a project that’s focus was on implementing adoptive planning and services for abandoned infants and boarder babies(1). Her work with vulnerable populations is a common thread throughout her career. One of Ms. Getz’s most notable contributions to Michigan philanthropy was the time she spent with the Michigan AIDS Fund. When the AIDS crisis came to light in the 1980s, the Michigan AIDS Fund (originally called the Michigan AIDS Fund Committee), was created under the umbrella of the Council of Michigan Foundations (CMF) to provide relief for this growing health and human rights issue. In 1988, while with the Kresge Foundation, Ms. Getz became the founding chair of the Michigan AIDS Fund. The Kresge Foundation gave her release time, which allowed her to spend one-third of her working hours as a volunteer leader for the Michigan AIDS Fund Committee. The Michigan AIDS Fund Committee was constructed to serve as a collaborative funding pool allowing donors to anonymously give money, which was then distributed amongst the early projects and organizations that cropped up in response to the AIDS epidemic. As Ms. Getz said of her thoughts on the launching of the Michigan AIDS Fund Committee, “for me, my interest was simply, ‘I don’t care how they got it, these were people that were scared and dying, and we need to do something.’” Ms. Getz has also noted that she, as well as fellow members of the committee, saw the AIDS epidemic as a human rights issue. This fueled their passion and determination to create a strong supporting organization for the new programs that were formed in response to the issue. The Michigan AIDS Fund Committee and its subsequent iterations, operate somewhat differently than the average organization. Ms. Getz noted that the leadership of this particular committee required passion, curiosity, and a willingness to learn from the community, as this organization was started in response to a new health concern while scientific investigation of it was just beginning. Therefore, much research went into the development of the committee. As Ms. Getz said, “We worked with the state, we traveled all over the place trying to find out what our priorities should be, trying to deal with them, what were workable things, and what weren’t. So we did a lot of traveling and real roll-up-your-sleeves struggling together as board members of the Michigan AIDS Fund. The Michigan AIDS Fund Committee transitioned in 1993 to a more autonomous position as a supporting organization of CMF, and became known as the Michigan AIDS Fund. At this point Ms. Getz changed roles and became a board member of the pooled fund while continuing to act as the grants committee chair. She retained both of these positions until 2002. The time had come for the fund to launch as an independent nonprofit organization. The legacy of the Michigan AIDS Fund continues on, now under the auspices of the Michigan AIDS Coalition following their merger with the Michigan AIDS Prevention Project in 2009. Ms. Getz has volunteered with many organizations over the years, including Fremont Christian Schools, the Women’s Economic Club of Detroit (now called Inforum: A Professional Women’s Alliance), Women in Philanthropy, Michigan State University Extension, Western Michigan Christian High School, Mackinac Island Honor Scouts, and the Newaygo Public Schools system. From 1979 until 2002, Ms. Getz also engaged with a number of committees within CMF. 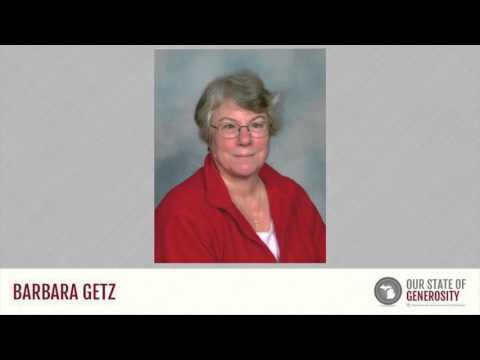 Throughout her career, Ms. Getz served the public both through her careful distribution of grant funds, and her work to protect the rights of vulnerable populations. During her years in philanthropy, Ms. Getz proved to have a deep interest in, and ability to connect with, the population being served in order to most effectively represent and address the needs at hand. One of the fundamental aspects of good grantmaking is the ability to engage with the grantees to maximize effectiveness, a quality that Ms. Getz and the Michigan AIDS Fund exemplify. Ms. Getz was interviewed regarding her insights and experiences in working with Michigan’s philanthropic community and the Our State of Generosity (OSoG) partners. The following are selected quotations from her interview specifically related to the five organizing themes of the OSoG project.